Welcome to our Idaho estate vineyard and artisan winery, located in Southern Idaho’s Snake River Valley AVA along the Sunnyslope Wine Trail. 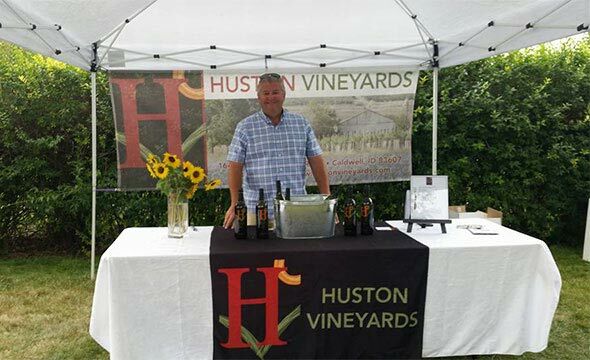 You’ll find Huston Vineyards on Chicken Dinner Road, adjacent to the historic town of Huston, Idaho. As farmers, first of all, our wines begin in the vineyards, whether one of our estate vineyards or a specially-selected vineyard, which might bring a unique terroir component to our wines. Each site is carefully farmed and personally managed to ensure the premium quality of our handcrafted, small lot varietal wines. Every year, 30 to 40 different small lots are carefully watched over in the vineyard and winery, ensuring that the very best of the Snake River Valley is bottled in each vintage. The Snake River Valley’s long and abundant growing history stems from our rich volcanic soils, intense sunlight, and warm, dry temperatures—and proximity to the Snake River. Fruit is ripened by the warm growing season, as well as the diurnal shift offering cool nights—preserving acids and creating fruit-forward wines with outstanding structure. Visit us, and enjoy what’s pouring at the winery—on Chicken Dinner Road, the gateway to the Sunnyslope Wine Trail, in the heart of the Snake River Valley AVA. Our mission is this: Great Wine, Great Foods, Great Friends, the Best of Times. 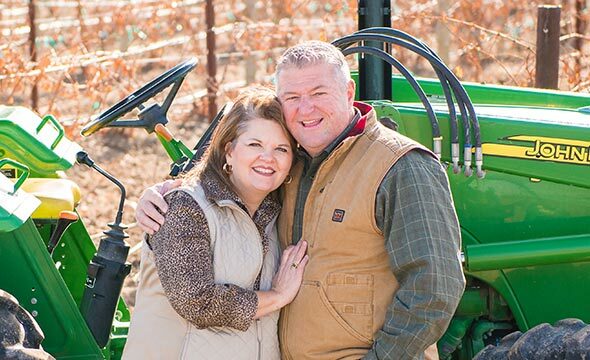 Huston Vineyards is nestled in a corner of vast farmland, an area with a long, rich agricultural history. The four distinct seasons give way in the spring to blossoming fruit orchards, vineyards and 100 different crops. Our long summer days and dry, cool nights extend into the fall season, providing the optimum harvesting bounty. The rich, volcanic soil of the Snake River Valley is thousands of years in the making. The area’s farming history is a century-plus success story, with sunshine in abundance, dry, arid conditions, yet with ample water for irrigation from our extensive storage systems. 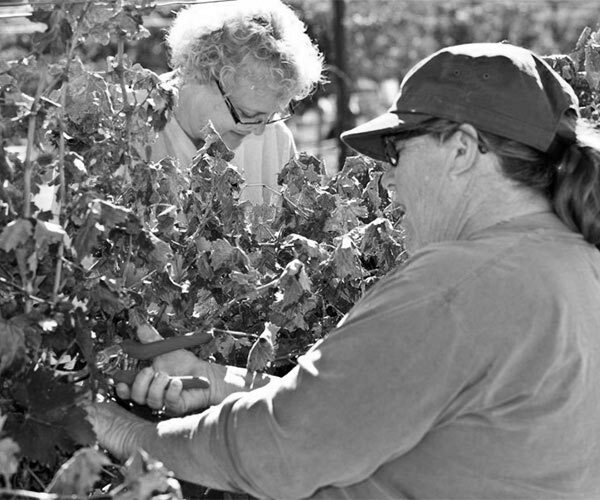 Vineyard plantings in the area took hold in the area around 50 years ago, and the viticulture designation was established in 2007. The relatively young wine region continues to expand, with soil, climate and elevation on par with some of the very finest wine regions worldwide. “Terroir”, the French term that has no English-language equivalent, is considered the force of a regional character, and the force reveals itself in the area’s best wines. The aroma, texture, and flavor reflect the specific grape variety. There is a complex combination at work in growing the fruit on the vine—involving the soil composition, topography, climate, and other environmental factors. All these nuances of the grape’s particular origin come together, and in the classic tradition of wine making, with patient oak-barrel aging—these nuances of origin are enjoyed right in your glass. Some call it the personality of place. Here, the warm days ripen the fruit, and cool nights conserve tannins and acids—creating fruit-forward wines with complex structure. Well-draining, rich, volcanic soil and ample water are both key to superb conditions. Along with the positive factors of this environment, you will find the collaboration of dedicated growers and passionate winemakers. We are immersed in the ancient, fascinating process of growing fruit, from bud break to a fermented pour—and love sharing it with our visitors. 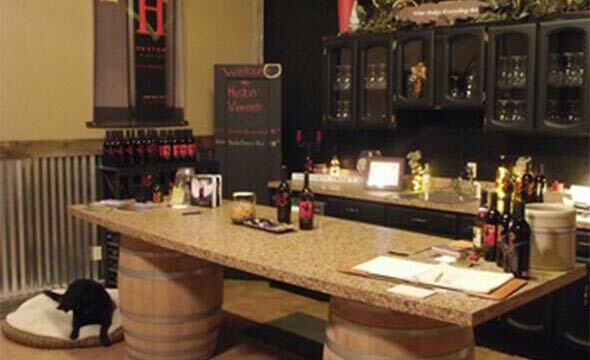 Huston Vineyards is the perfect entry point to the Sunnyslope Wine Trail. We welcome you to our winery, where you can enjoy our wines in an unpretentious farm setting that is as inviting as the expansive shade of our towering Locust tree. It’s a place with lots of heart, enriched by the sun. 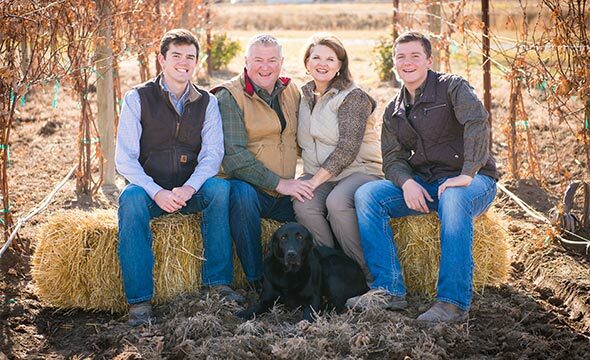 Raised on Southern Idaho farms, we found the ideal spot to farm, raise our boys, and cultivate a vineyard and wines of distinction on Southwest Idaho’s Chicken Dinner Road, adjacent to Huston, Idaho. Huston Vineyards has made its unique mark amid the collection of notable wineries along the Sunnyslope Wine Trail of the Snake River Valley AVA. As Huston’s proprietors, we are meticulous in every way, from start to finish, having our fingerprints on everything from pruning sheers to fruit and clone selections, to racking barreling and bottling, from collaborations, to oversight. 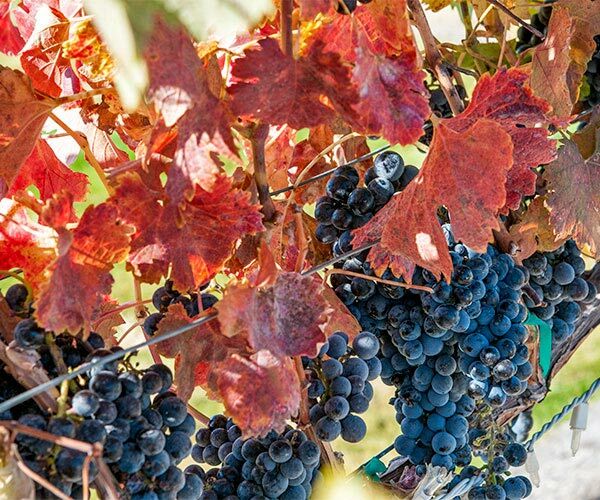 As members of the Snake River AVA and a popular stop on the Sunnyslope Wine Trail, we are immersed in the Idaho wine industry, and very active participants in fostering the distinct wine experience of the region. 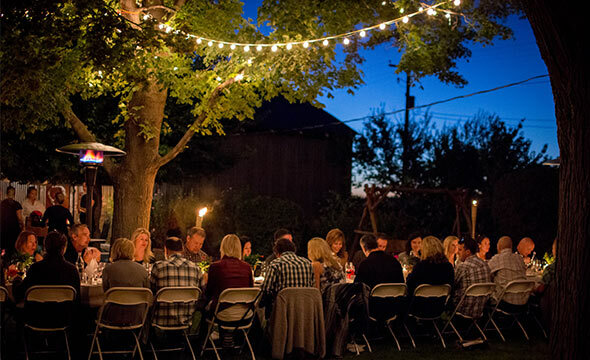 This has included participant leadership with the Idaho Wine Commission, local communities in establishing tourism and destination development, and many farm-to-fork dinner events, joining with other local growers. Our relationships and collaborations with area wine industry members have enriched our offerings both from the bottle and with special events. Our enjoyment and passion is shared in our welcoming winery, located near our farmhouse and adjacent to the vineyards and farm. This platform allows us the opportunity to showcase the beauty of bringing local produce, fruit and proteins grown in the region, and paired with the perfect world-class wine, in order to appreciate the terroir of the local earth, where the fruit begins at the vine, and is finished by the sun, and surrounded by the fertile farmland of the Snake River Valley. Although we ventured off the farm to gain our Idaho college educations, the lure of the land and the mystique of winemaking brought us to Huston. With our shared upbringings of dawn-to-dusk chores, 4-H and FFA ribbons, and a Mama’s warm kitchen—this is where we weave the fabric of our lives. With the backdrop of the lavender shades of our blooming flax field, to the deep burgundy stains of our harvest crush, our sons raise colorful, fresh vegetables, priced to sell. Growing and aging is not reserved for the vineyard alone! And the beauty of a magic-hour sunset over the Owyhee Mountains is a daily reward. Stop in, and enjoy this special place with us. 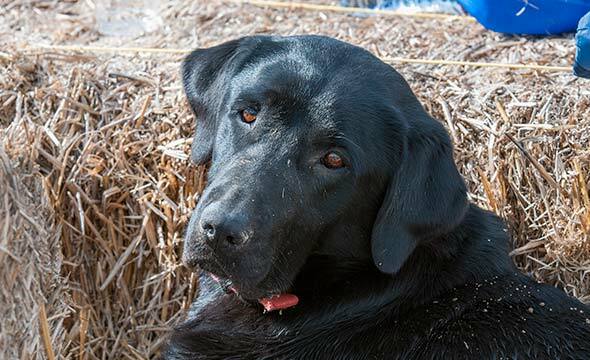 Expect a tail-waggin’ welcome from a four-legged member of the Alger family—gentle and friendly Hershey, our vineyard greeter. 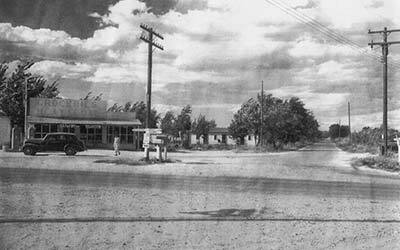 Established in 1911 as the agriculture portal to Southwest Idaho’s urban communities, the town of Huston, Idaho was the transportation hub for farmers to ship fresh fruits and vegetables via the Boise Interurban Railway. Locavore wasn’t just a philosophy, but a way of life, as surrounding towns received the freshest produce from the market basket of Huston and the nearby farming community. Not much remains of what was the historic town of Huston. There is still a tiny post office. But the fertile agricultural region continues to thrive and expand, including the continuous additions of vineyard plantings. Huston Vineyards is on Chicken Dinner Road, which has its own history behind its unique road name. Legend has it that an Idaho Governor was persuaded to fix the old country road by way of a delicious chicken dinner. The farm cook served up a fine feast, and the sign directing the governor to the dinner remained long after the deal was struck. The Chicken Dinner Road name stuck. You could say this very same determination and gastronomical excellence is carried on by the area’s modern day vintners. Our line of table wines, Chicken Dinner Red and Chicken Dinner White, are award-winning wine blends, proudly offered at our tasting barn. New to the Chicken Dinner lineup is our Rosè. You can also enjoying tastings of our Huston Vineyards Private Reserve wines, as well as our Snake River Valley series. 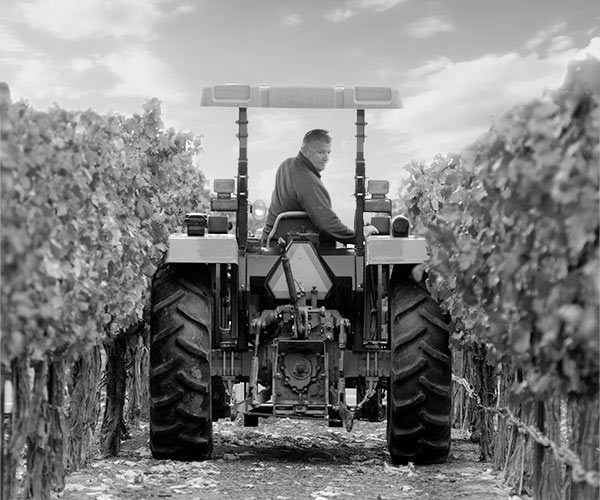 Much like the mission of Huston, Idaho back in 1911, the aim of Huston Vineyards is to cultivate and distribute the results of the freshest bounty from the land. In our case, the bounty is some of the Northwest’s very best fruit—crushed, fermented and aged—resulting in premium wines of distinction. Enjoy and savor the Valley’s prized produce, manifested in the aroma, texture and flavor in your wine glass. We have more tales to tell! Our estate vineyards are well-tended, nourished by the abundant sunshine of the Snake River Valley. Our piece of earth has many factors in its favor: rich, volcanic soil; over 2,500 feet in elevation; a long growing season, with the diurnal shifts of warm days and cool nights; and an arid climate, with ample storage water for irrigation. This complex combination produces grapes with outstanding varietal character. All these nuances are reflected in our wine, as our objective is to produce premium wines that highlight the fruit. This is revealed in the aroma, texture, and flavor. “Terroir”, a French term, is described as the force of a regional character. With the long, fertile history of the Snake River Valley, and the success of world-class wines coming from our region, the future is as bright as our Southern Idaho sun. Our piece of earth is insulated by the Snake River, with a backdrop of panoramic mountains and vistas. Long-existing fruit orchards, and numerous acres of specialty crops surround us. 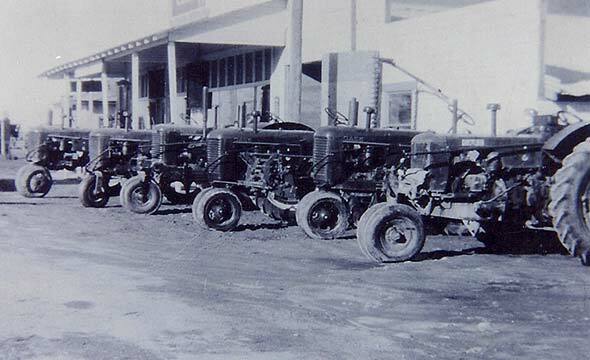 The valley’s first substantial vineyard plantings are about 50 years old, but the fertile growing history extends much further. A range of vineyards cross the valley, with variances in slope, microclimate, and soil. 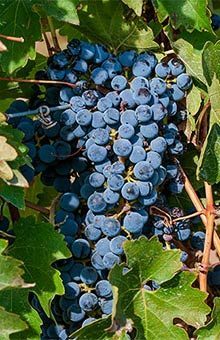 The first estate vineyard was made up of exclusively red varietal plantings, including Cabernet Sauvignon, Merlot, Syrah, and Malbec. Additional varietal and other blocks will be planted over the next few years to incorporate the diversity of soil types and structure that is located within the AVA. Each year there is a grand celebration of the harvest held at the winery and vineyard; a day of celebration that is not soon forgotten. A start to the morning with fresh brewed coffee, followed by a hay ride out to the vineyards, cut some grapes and compete against your closest friends, back onto the tractor and hay wagon for a much anticipated local Idaho food feast with your favorite Huston wine, afterwards. Experience an old-world crush—no shoes allowed! 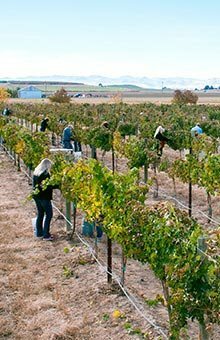 Full day in Idaho wine country… our way of life! Along the Sunnyslope Wine Trail, meandering through the Snake River Valley AVA, are an array of vineyards all with different row orientations, soil structure, canopy systems, slope and slope orientation, each contributing in their own way to the unique terroir of the wines. We have diligently selected unique sites to add individuality and complexity to our wines for multiple reasons; we work very closely with each vineyard in insuring everything is grown and managed to our own criteria. At harvest our red varietals are all hand–harvested, insuring that each cluster has ripened evenly and fully and is disease free before making its way into the harvest bin. Our aromatic whites are machine harvested, allowing us to pick late into the night, insuring that the fruit arrives in the winery ready for press and at a cool temperature. 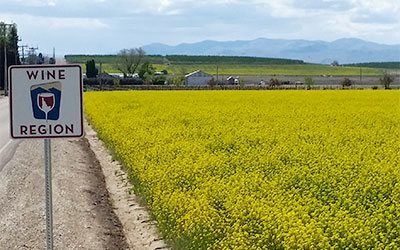 Keep on the sunny side of life, along the Sunnyslope Wine Trail, in the heart of the Snake River Valley AVA. Huston Vineyards on Chicken Dinner Road is an ideal launching point to a day on the trail. Look for our sunny yellow farmhouse, and the adjacent barn. We’d love to share our wine with you here, with tastings in our welcoming “Tasting Barn.” Bring a picnic, and enjoy the shade from the vast canopy of our giant Locust tree. Our four-legged, tail-waggin’ Hershey loves visitors as much as we do, so expect a friendly (and gentle) welcoming. 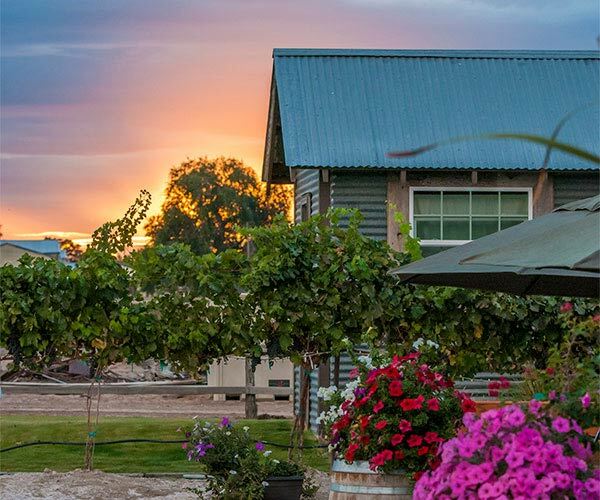 The trip to the Sunnyslope Wine Trail is an easy drive from outlying towns and cities, including just under 20 miles away from the western edge of Meridian. After arriving at Huston Vineyards, there’s no need to hurry along. But once you are ready to hit the trail, a range of winery experiences await. It is a great place to take out-of-town visitors, and each season of the year has something special to offer. Enjoy the blossoming fruit trees throughout the valley in the spring, and the fall colors during the harvest. Summers here guarantee beautiful evenings to catch a sunset, and winter holiday events are a popular attraction, particularly over Thanksgiving weekend. Check our Calendar of Events for year-round happenings at Huston Vineyards, as well as multi-winery events along the trail. Plan a visit soon—you’re sure to find it enjoyable, memorable, and a place where you’ll find many happy returns. 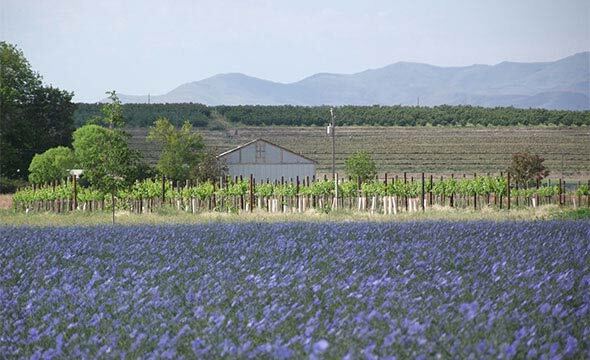 Read more about the Sunnyslope Wine Trail. Visit our “Winery Barn”—there’s no hay on the floor, and it smells only of luscious, premium wines and whatever the chef has paired that day. You’ll be welcomed and invited to taste our offerings and food pairings on special days. Bottles of wine are of course available for purchase, and you may find the perfect memento of your stop in our gift area—from hats, t-shirts, and farmhouse aprons, to customized items to enhance your wine experience, like decanters and aerators. Huston Vineyards’ hours of operation are 12:00 pm – 5:00 pm, Wednesday through Monday, or check our calendar for special events. However, we can accommodate openings outside of those times by request. Just contact us, by phone (208-455-7975) or by filling out the form below. 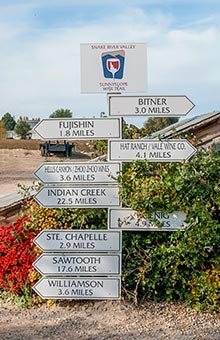 Make a trip to visit us, and we can recommend other stopping points on the Sunnyslope Wine Trail. We are known as an ideal launching point to the area’s trail of wineries. You are always welcome to bring a picnic and enjoy the inviting canopy of shade under our giant Locust trees. 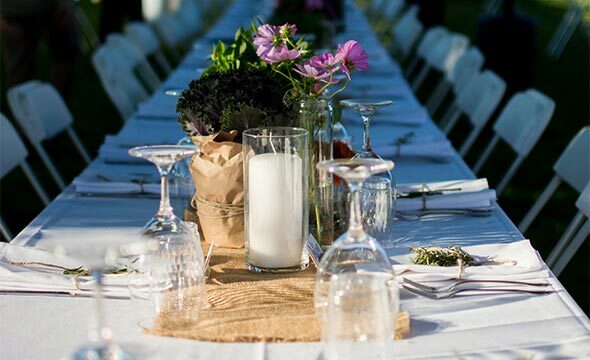 Check our calendar for regular events at Huston Vineyards, including release parties and farm-to-fork dinners. We are also a participating winery of many holiday events along the Sunnyslope Wine Trail. Information about these events can be found at sunnyslopewinetrail.com. Farm-to-Fork, Farm-to-cork—there is life when you bring together the locally grown food and pair it with the wine that is grown in the same soil. In the Old World, this has been taking place daily for 100’s of years. We start with the outstanding fruit of the Snake River Valley—grapes that are ripened by the sun and balanced by the cooler evenings. We are so fortunate to have abundant local sources in the valley for produce, meat and other fine edibles—along with the chefs who have the skills and creativity to maximize flavor and the overall dining experience. Pairing our different varietals with local food brings out some magic for both, in flavor, aroma, and texture. The weight of the food is a good starting point to the pairing concept—as in a heavy roast with a Cabernet Sauvignon. From there, it expands to objective measures of taste, like acidity or sweetness. Strategies for pairing can include goals to contrast, or to complement. Our goal is to always make it accessible to our guests, sharing how the enjoyment of a particular food and its preparation can be enhanced when paired with a certain wine. “Braised Elk, meet Petite Sirah. Dry Riesling, meet Asparagus Chevre Tart.” The marriage of food and wine, and the collaboration of chef and winemaker, is one backed by stories of the ingredient’s origin, or perhaps transformation. And we love a good story—and love sharing them with you. Some of the area’s best chefs have joined us here at Huston Vineyards, offering memorable gastronomic evenings for our guests. Our wines have been paired with pork, and with paella (“pie-ay-ya”—a Spanish and Basque specialty). Our wines have teamed up with trout, tenderloin, sturgeon, and truffles. Charcuterie and our Chicken Dinner? Perfectly paired! Along with actively supporting Farm-to-Fork happenings at Huston Vineyards and out in the community, we also enjoy our relationships with restaurants who daily serve up the best in fresh, local fare. Check our Wine Finder to find other restaurants that serve Huston Vineyards SRV Series wines and appreciate the Farm-to-Fork experience. We are immersed in our local community. 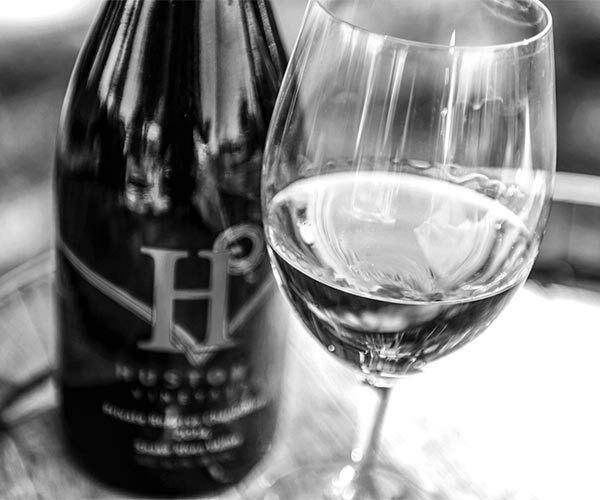 We love sharing our pours of Huston Vineyard wines for all to sample and enjoy. We love celebrating the story of Snake River Valley wines, and how our own vineyard and winery came to the table. 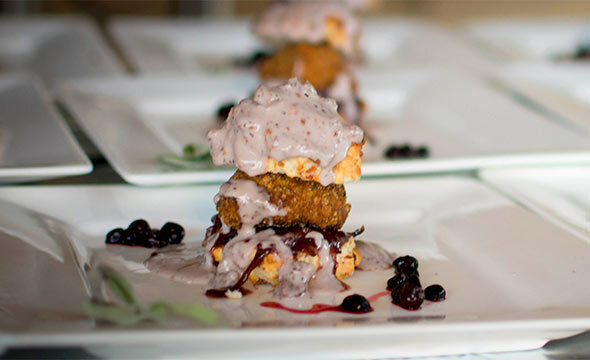 We are active participants with the Idaho Wine Commission and their events, like the annual “Savor Idaho”, a celebration with samplings of the best in local food and wine, and an always-sells-out event. 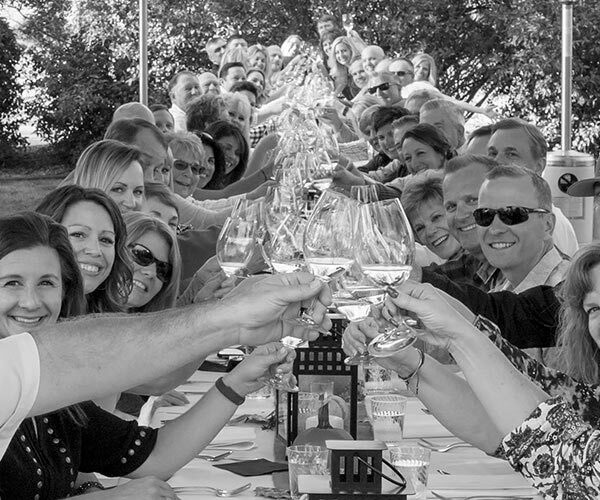 Along with hosting events at our vineyard, like World Malbec Day, farm-to-table dinners, and wine release parties, we are regular participants in Sunnyslope Wine Trail events. The wineries of the valley regularly come together and play host to collective celebrations that make traveling from winery to winery an extra special treat. The most popular annual events occur on the weekends surrounding holidays like Valentine’s Day, Mardis Gras, St. Patrick’s Day, Mother’s Day, and Thanksgiving. Find information about these events on our Calendar. The wineries of the Sunnyslope Wine Trail also participate in annual events like Wine & Art in the Park, each May in Marsing. The Sunnyslope Wine Trail Festival occurs in August in downtown Caldwell, Idaho at the Caldwell Train Depot, with an afternoon of music, wines from the Trail, and lots of delicious, local food offerings. We are also pouring on Saturdays from spring to fall at Downtown Boise’s Capital City Market. Find us from 9:30am–1:30pm in front of the Matador restaurant. We also love opportunities to share our wine at tastings at wine specialty shops like the Boise Co-Op, and at grocer’s wine departments, like Albertsons. You’ll find us at events in Southern Idaho and beyond, where an invitation to share our wine gets us out on the road, beyond our own Chicken Dinner Road. Just look for the big red “H”.